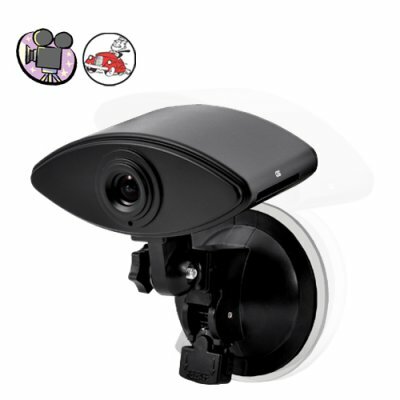 Successfully Added Car Video Recorder with Laser Sighting to your Shopping Cart. Designed to be mounted on a car dashboard or windshield, this Car Video Recorder enables you to easily capture video of road situations. Useful for insurance purposes, security surveillance, or just fun! This new tech gadget is the latest in our famous series of Car Video Recorders. With a Laser Sighting, SD Card slot, 720x480 resolution video recording, and buttons for accessing all its primary operating features, the new J06-2GEN model makes the perfect model for anyone who does work activities while in their car, van, or truck. To start recording the days events, you simply insert your SD card and press the record button. With today's large memory cards, you can easily record all day long with a single SD card. The J06-2GEN mounts directly onto your windshield or dashboard using the included mounting kit and is conveniently powered from your cars cigarette lighter. The Car Video Recorder with Laser Sighting records videos in a computer friendly AVI format at 720x480 resolution, so you can record all the days events and then take the SD card out at then end of the day to transfer the file to your computer, making record keeping simple. Then just put your SD card back into the Car Video Recorder with Laser Sighting to start another days recording. This unit is in stock now and available for single piece or bulk quantity orders. Order it today and we'll ship it out tomorrow! The J06-2GEN Car Video Recorder with Laser Sighting is proudly brought to you by the leaders in factory direct wholesale electronics, Chinavasion. This camera has no internal memory and does not come with an SD card. Please remember to insert a memory card before driving away from the office! It's ideal for professionals out in the field, whether you're monitoring road conditions or just need to keep track of what's going on out there! This car camera makes recording and archiving your videos easy. There is no need to ever remove the car video camera from your vehicle. No, this camera only records video. When you say it has "Laser Sighting" does that mean there is a red laser on all the time while I am driving? NO. The laser only turns on for 5 seconds, just long enough for you to adjust the camera sighting when you are setting up. After that you will not see the laser unless you want to see it by pressing the sighting button. on 2011-07-17 05:13:19 Works good. This work as it should. I have one on my Dash great video you can place this camera any were in your vehicle.